Every morning I awaken to an assortment of furry faces staring at me in anticipation of breakfast. Of course all of my cats are the best examples of feline beauty to ever meow on this earth. But usually one sticks out in its extraordinary catness each day. Before I am fully awake, I reach for my iPhone and I start snapping photos. Then I share the most endearing photo on Facebook. Within seconds, I start getting alerts to “Likes” and comments on the photo. It goes on all day, and sometimes continues into the next day. I’ve read articles by so-called social media experts suggesting that you should not post too many pet or baby photos on Facebook. They say it annoys people. They obviously don’t know me or my Facebook friends. I am a serial “Liker” of baby and candid pet photos, and my friends seem to be too. Here is the real reason I share my cats’ photos. Although my studio is a few paces from my home, I still spend many hours away from my cats each day. When I share a photo of the sweet moment I have with them in the morning, I take it with me all day, and it keeps me close to them. Each time I get an alert that someone “liked” or commented on the photo, it makes me smile. I need those extra smiles some days. I guess the photo makes my friends smile too. What’s the harm in that? 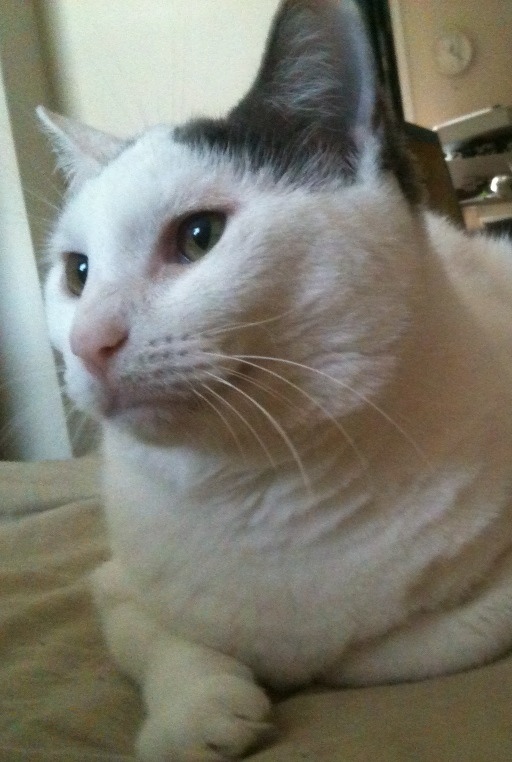 Okey – The cat that changed my life. This auction has been reopened. Bids will be accepted until 10pm Sunday, 3/18/12. I have concluded my series of feral cat drawings of a colony of cats with which I am intervening. Although there are still a couple of cats to be trapped and neutered, I have drawn all of them, and I think it is time to bring the series to a close. All of the cats are doing well and now have greater potential for longer lives. And the overpopulation worries are over. Thanks for following the series, and thanks for caring about the real cats that inspired the drawings. Today, I drew a picture of my cat Okey, the little cat who changed my life. Without her, I would have never thought of intervening with feral cats. You see, Okey was a stray cat, dumped on the streets of downtown Canton, my home. I rescued her in October of last year, and my life has been changed ever since. The movement that she inspired has motivated others around the world to take the welfare of cats and other animals more seriously, and for that I am very grateful. She also has become my very dear, sweet companion. Highest bid at 10:00 pm EST on Friday 3/9/12 wins the piece. 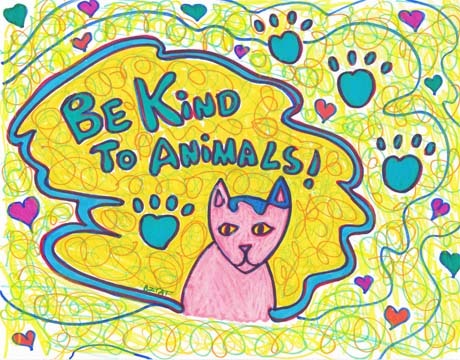 December Doodles – Be Kind to Animals! I love to scribble, and I kinda went to town scribbling on today’s doodle. It is not without a message though. I thought I would have a little fun, yet draw my Okey to share an important sentiment. Highest bids at 10:00 pm EST on Saturday 1/10/11 wins the auction.